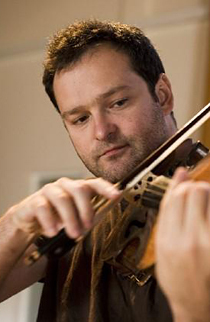 Krzysztof Chorzelski, viola, was born in Warsaw in 1971 and enjoys a diverse career as a performing musician that has taken him all over the world. In 1992 he won the Wronski Solo Violin Competition in Warsaw and has performed as a recitalist and concerto soloist in Europe as well as made several radio recordings for the Polish Radio and the BBC. Since 1996 Krzysztof is the viola player in the highly acclaimed Belcea Quartet – touring worldwide and recording exclusively for EMI Classics. The quartet’s recordings have been awarded the Gramophone, MIDEM and Diapason d’Or Awards. Krzysztof is also Chamber Music Professor at the Guildhall School of Music and Drama in London, where the Belcea Quartet have been appointed as the Quartet in Residence. He is a frequent guest at international festivals such as the Spoleto Festival in Italy, Spannungen in Heimbach, Germany, the Oxford International Chamber Music Festival, the Four Seasons Chamber Music Festival in North Carolina, USA and the Moscow Chamber Music Festival “Vozvroshchenya”. He has also been invited by the Alban Berg Quartet to perform as a guest violist in a series of concerts celebrating this year’s 250th Anniversary of Mozart’s birth in the Konzerthaus, Vienna. Krzysztof has also studied conducting at the Royal College of Music and is currently further pursuing his interest in this field.